ABA Music, Inc. is a relatively young company, but the talent and experience behind it are not. With the knowledge in flute playing, repair, design, manufacturing, and metallurgical engineering, we are proud of our ability to consult with our customers in all aspects and provide unequalled service. 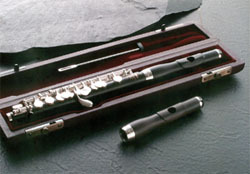 Flute playing is an art, so is flute making. Without adequate maintenance and service, however, even a wonderfully made instrument would not be able to offer sustained performance. We would like to think us as being a service company. Besides presenting some of the best instruments of our time to the market, we strive to keep your flute in its best playing condition. Constantly learning new technique, using the best parts, and paying attention to individual needs are our service goals.